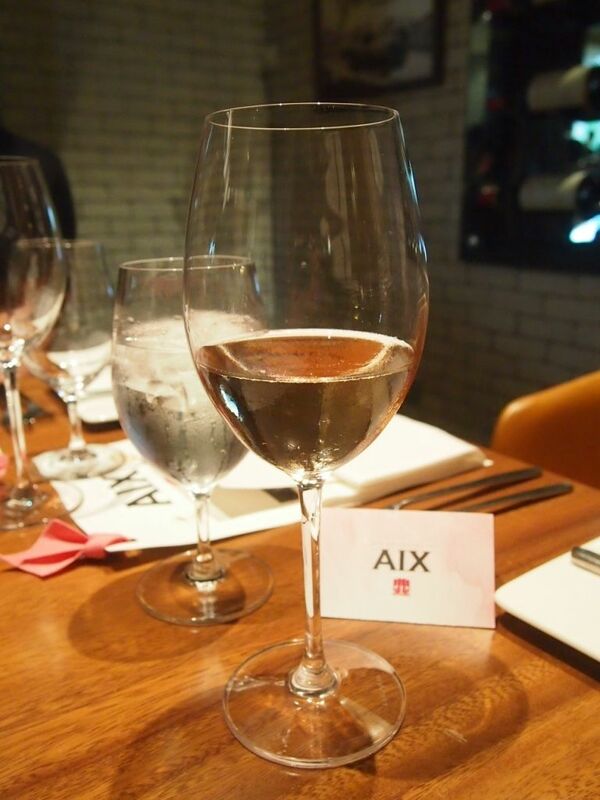 Chef Douglas Tay of Osia came up with a menu to complement the delicate AIX 2015 Vintage Rosé. I have to say that he did an unbelievably great job in showcasing the brilliance of the exquisite wine with the myriad of flavours incorporated into the specially tailored menu. Produced from the 72 hectare Maison Saint Aix, located 25km from Aix en Provence, is a classic Provencal blend of Grenache, Cinsault and Syrah. The vineyards are exposed to northern mistral winds which naturally protects the vines from parasites. A great deal of sunshine in the day, cool temperatures in the evening and traditional techniques of harvesting ensure that the grapes are cultivated to optimum ripeness and maturity before they are picked. Wine-lovers can be assured that they are only getting the best with AIX. The 2015 AIX Provence Rosé possesses a pretty salmon pink colour that is brighter than his predecessor and fruitier. The Rosé is equipped with a light and captivating scent of strawberry and white peach. 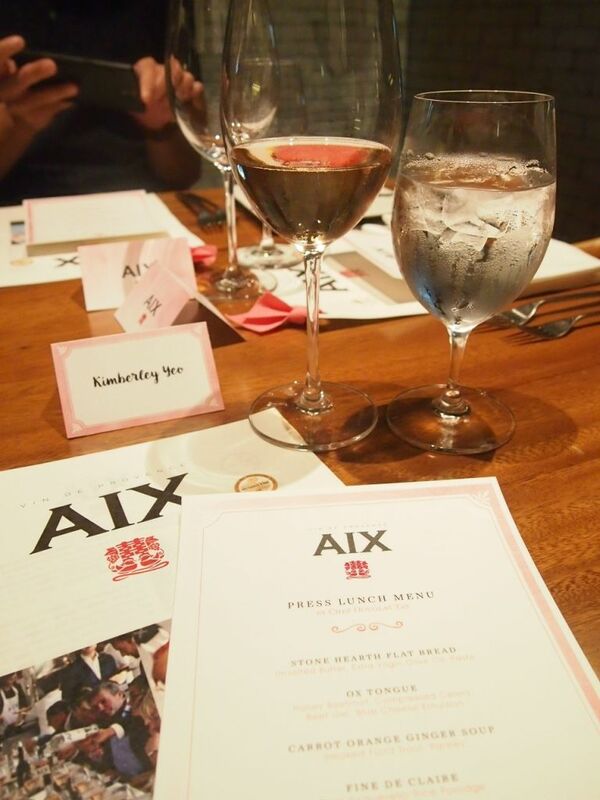 Mr Sake Weima, the owner of the winery, joined us for lunch and told us all about the story behind AIX. It was a huge honour to be able to meet him in person. 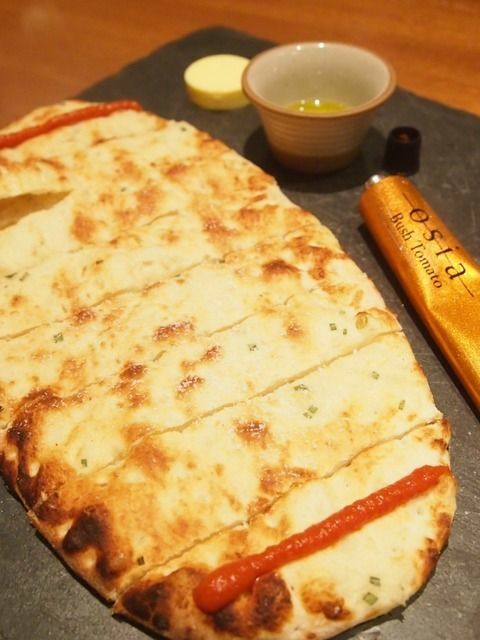 We were off to a good start with the flat bread which caught my attention before it even arrived at the table because it was so aromatic. The flat bread had a really nice stretchy layer beneath that paper-thin crust. Slather the bread with butter or some of that housemade bush tomato for an even more delicious finish. I love bread so you can imagine how much of this I had. 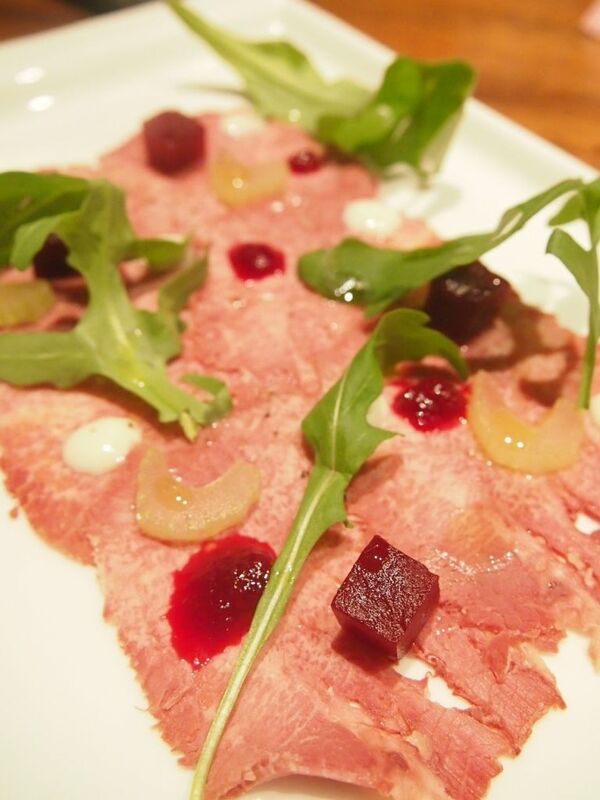 An unexpected starter of ox tongue paired with blue cheese emulsion, beet gel, honey beetroot and compressed celery proved to be a real treat. While it may seem a little daunting, Chef Douglas did a fantastic job in balancing the flavours. 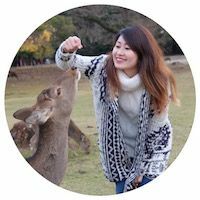 A sip of the light rosé clears up that velvety feeling that lingers on your tongue after every bite of the ox tongue. The rosé is truly a refreshing wine. 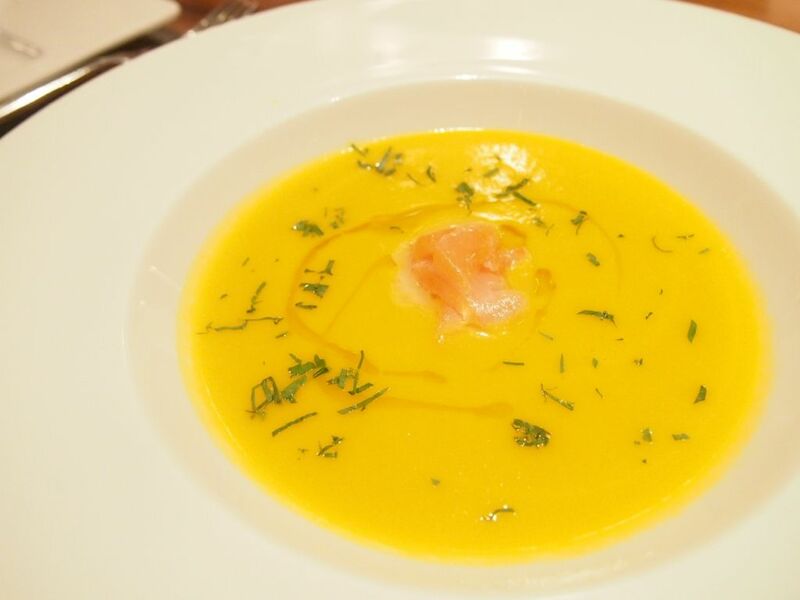 A unique and luscious soup that has a really strong ginger taste. It was comforting and satisfying but the highlight was the piece of Smoked Fjord Trout that was immensely tender and flavourful. It was interesting how both the soup and trout were each characteristically strong in flavour but they didn't overshadow each other. Here we have quality Acquerello rice made into porridge with a piece of premium Fine de Claire oyster. 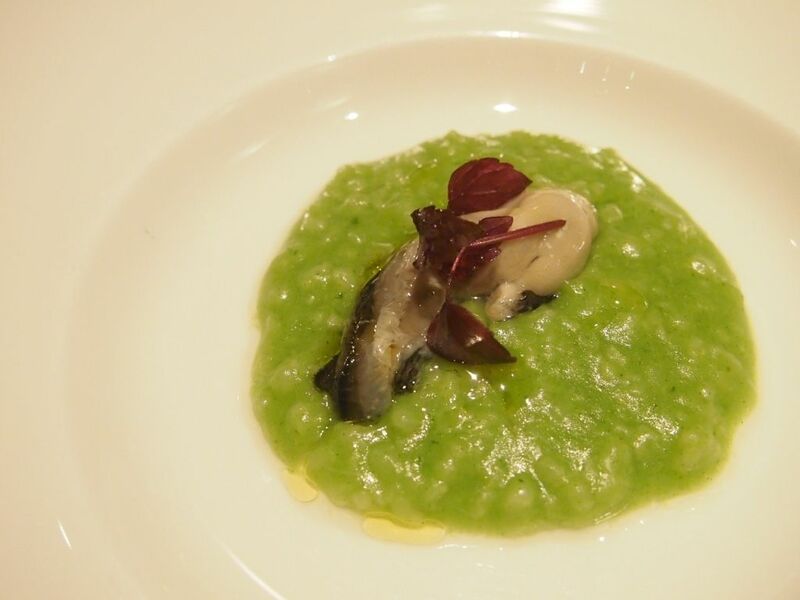 The green in the porridge comes from basil and while the porridge was pleasant on its own, the oyster added a burst of bright flavour to it. Quite unanimously the favourite dish of the afternoon. Pork belly gets me everytime. That thick juicy layer of fat is always the star for me, followed by a tender layer of firm meat with a great bite. 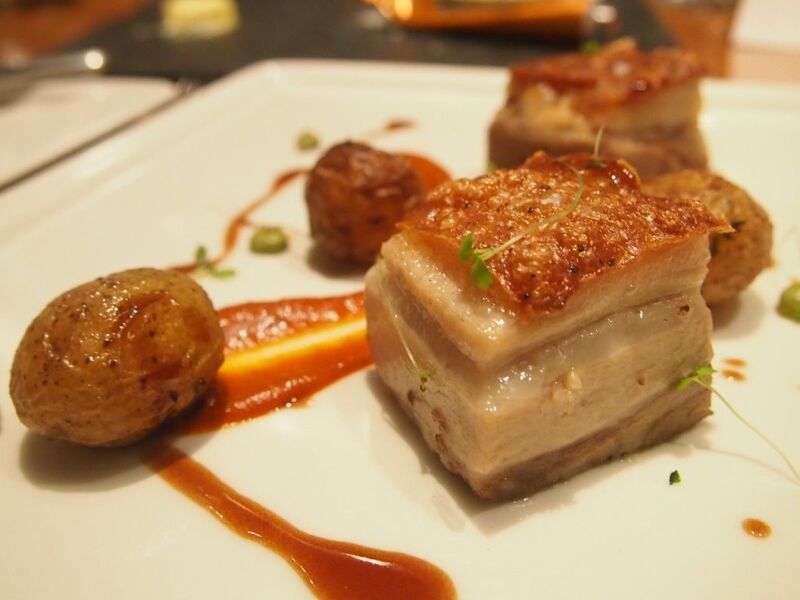 The pork belly in this dish was topped off with a crisp skin which was an added bonus. 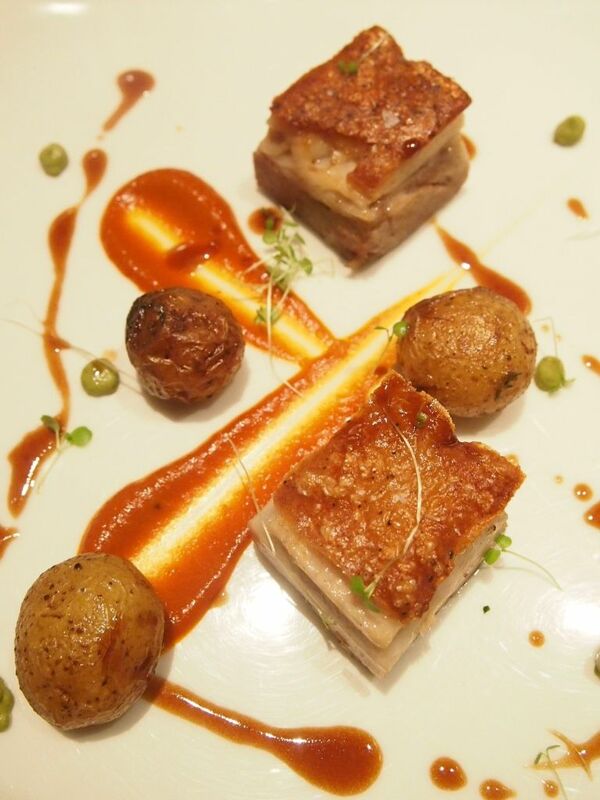 Accompanying that more-than-delightful block of pork belly are new potatoes, a Piquillo pepper coulis and blobs of Tarragon mustard. 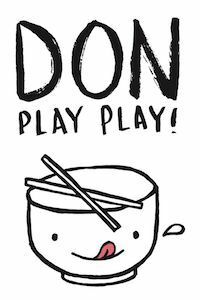 Those sharp hints of harshness from the pepper and mustard elevated the taste of the pork belly. 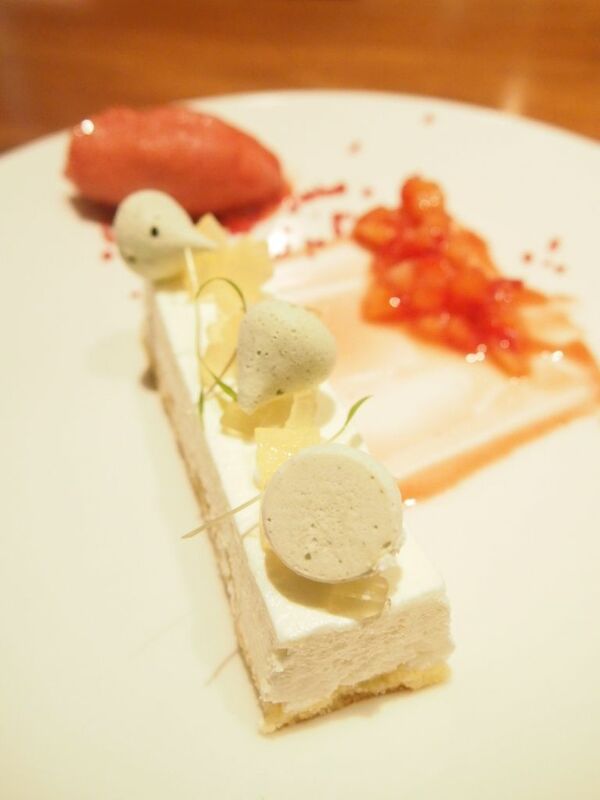 Atop an olive oil sponge sits a fresh cheese mousse with basil meringue and yuzu jelly scattered on top. I took to the cheese mousse more readily than I thought I would. The cheesecake was not the smoothest but it was creamy and most importantly, very light. The fromage worked hand in hand with the citrus jelly and quirky basil meringue to deliver quite a flawless end to the meal. While the highlight was the strawberry sorbet, I skipped it as I don't take strawberries. The cheesecake was definitely one of my favourite renditions to date. I had about seven glasses of AIX Rosé and I can't tell you how much I enjoyed it. It's been a long time since I've come across a glass of Rosé that is so easy on the palate, so smooth and so refreshing. AIX is also the first in the world to come up with a Rosé glass. 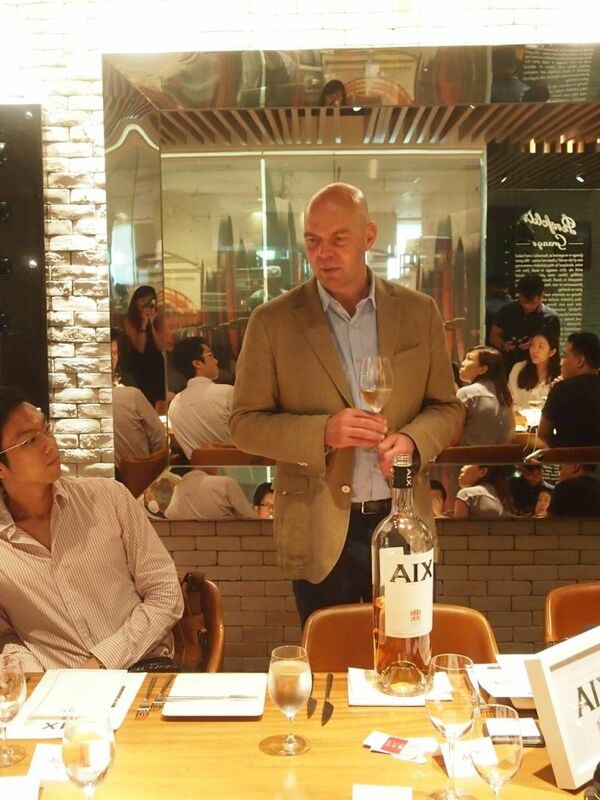 You can purchase the AIX Rosé wine which comes in 75cl, 1.5L, 3L and crazy 6L and 15L bottles at Straits Wine Company.